I have JUST started work on my new allotment. It is Denton, Northamptonshire, the village I lived in for many years when I was younger. I seem to have drawn the short straw and have a plot at the bottom of the hill. Nobody else wants it as the site is overgrown and a bit damp. Maybe it is an initiation test to see if I am up to it. I know that you are allowed to change plots once you are established, as long as there is a better plot spare. There is a hedge and some tall trees, but they ae on the north side, so not really affecting the light reaching the plants on my plot. The plot is at the bottom of the hill, but the slope continues for many more yards after, so once the ground is properly dug and cultivated the wet should not be a problem. If there is hot weather the position may even be a blessing. The allotment before work started. Part of the ground was covered in old carpet by a previous tenant who has since moved on. The carpet was intended to smother the weeds and kill them, yet there is a lot of bindweed that is already showing above the soil in the uncovered areas. The old carpet has done its job and now needs dumping. I know the weed problems as I used to live close by; the soil is heavy and there are all the best noxious weeds- bindweed, docks, nettles, dandelions and couch grass. The carpet has controlled some of them, but the bindweed has just moved out or come up between the carpet. My biggest problem with the carpet is that the worms have also moved and the soil structure has been ruined. Another problem is how to get rid of the old carpet? It looks horrible! It was a pleasant day, sunny with a soft breeze. Sheep bleated in a nearby field and the birds were singing. Several fat pigeons watched me dig, no doubt wondering which dainty morsels I would be planting for them. It was very peaceful until somebody on a nearby plot started at small whining rotovator. It was too small to do much good. He took two hours to break down a very small area of previously dug soil. I could have finished in a fraction of the time using a fork. I was painful to both watch and listen. I used a spade to dig the uncovered soil. It was very hard work lifting the waterlogged clay and I needed my trowel to clean the spade as regular periods. Even a stainless steel spade blade would not cope much better than my old spade. Stainless blades are also very difficult, if not impossible to sharpen. I have little time for using blunt tools. I think stainless steel tools look pretty in the tool shed, but are not so good once you get out to do some proper digging on heavy clay. On the grass areas I used a fork as it was easier to get into the ground. 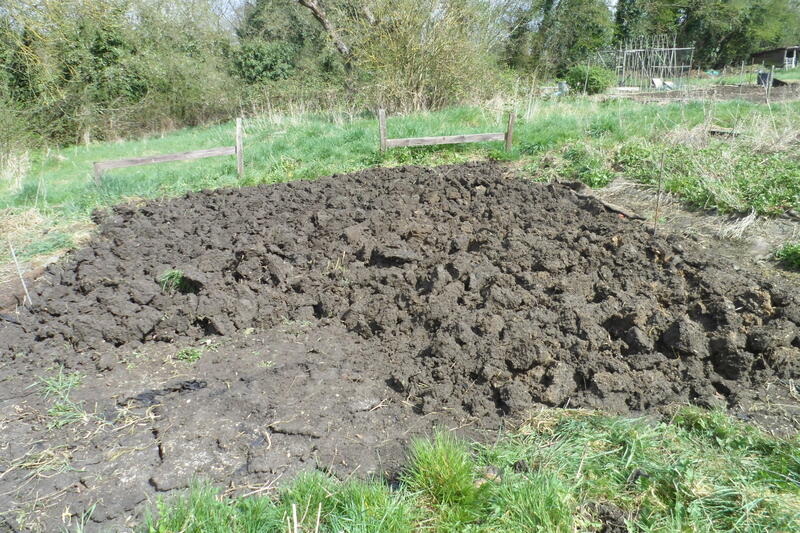 After some eight hours the plot was dug over and I had started to break up the larger clods that had already begun to dry out having been exposed to the sun and wind. Once the soil was dug I tried to tidy the plot. 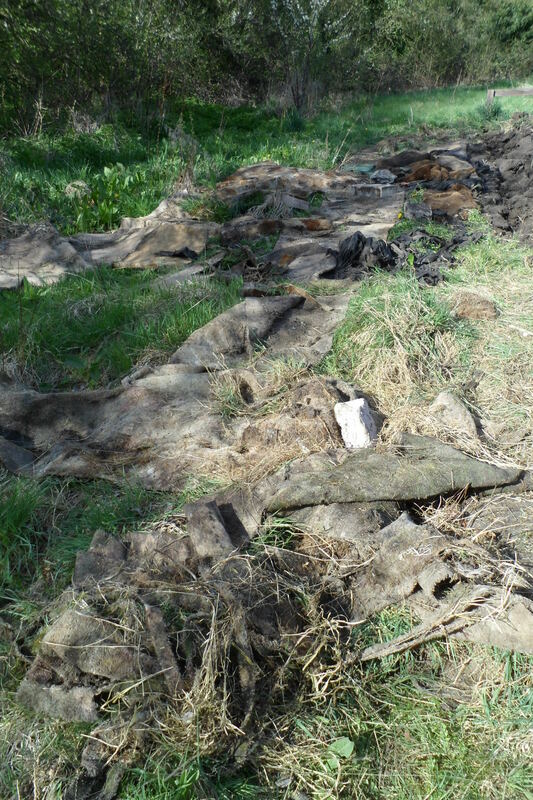 Partly burned rubbish and wood have been made into a pile ready for another bonfire. Plastic bottles have been bagged for recycling. I have spread the old carpet over a patch of weeds to keep them under control for now. Later I shall compost the carpet that will break down, the rest will go to the tip. Nearly half way through digging the plot. This area will be sown very soon, the rest will need a lot of serious weeding. The plot is now dug and the soil is drying in the sun and wind. 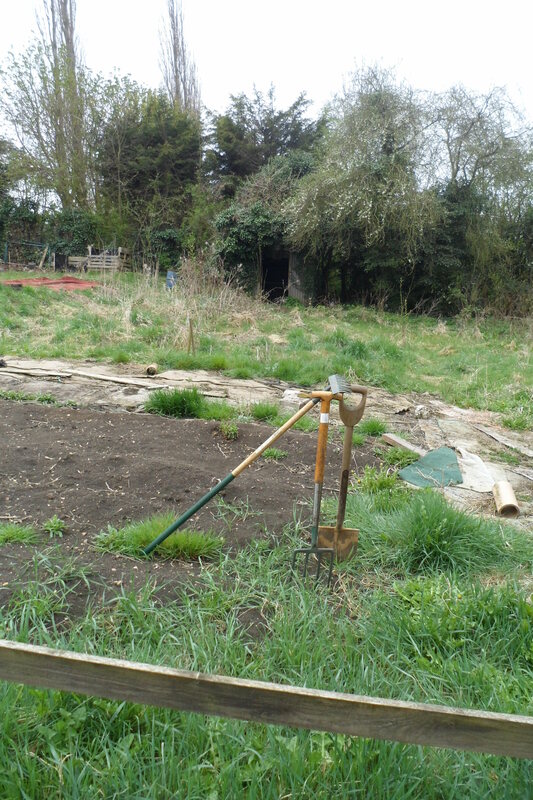 I have weeded part of the soil and Sowing is planned to start next weekend, weather permitting….